The Rocky Tops trail is located in the Navajo Rocks Mountain Bike Area north of Moab, Utah. The 4.4 mile trail connects the east end of the Ramblin trail with the east end of the Coney Island trail. 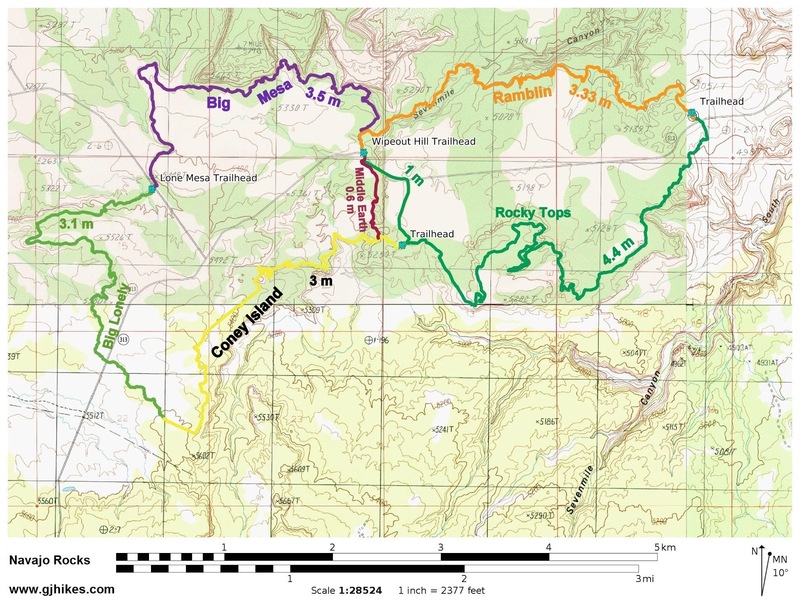 The 4.4 mile Rocky Tops trail and the 3.3 mile Ramblin trail can be combined to make an 8.7 mile loop that is commonly known as the Navajo Loop. 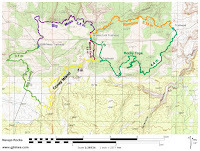 The additional mile of distance comes from a section of Highway 313 and a jeep road that are used to complete the loop. The Rocky Tops trail begins across Highway 313 where there is a parking area at the east end of the Ramblin trail. As the trail begins it crosses numerous domes of Navajo sandstone that are interconnected with stretches of sand and shallow dirt. The route is marked with green paint that is striped across the slickrock surfaces. After crossing numerous small domes the trail starts wrapping around the contours of Seven Mile Canyon as it progresses westerly. Near the 1 mile point the trail connects to a doubletrack jeep road and levels out. After a half mile of easy road travel the trail returns to more 'rocky tops' and dirt singletrack. At one point the trail follows along the slanted slope of what looks like a long cliff of entrada sandstone. Fortunately there is plenty of grit to provide good traction for mountain bike tires. Near the west end of the route the trail drops down a steeper section of slickrock before reaching the grassy bottom of an open park. The trail ends at its junction with the Coney Island trail. From here a doubletrack leads back out to Highway 313 where you can roll down the pavement to get back to the beginning, or if you are doing the Navajo Loop you can go the other direction to the Wipeout Hill trailhead. Since Coney Island is best done going the opposite direction it wouldn't be a good route to continue on. For this post we parked at Wipeout Hill and road the Navajo Loop by first riding down the Ramblin Trail before picking up the Rocky Tops trail and returning to our vehicle. We still had plenty of energy left over to go hike about 4 miles while doing the Dinosaur Stomping Ground trail in the Klondike Bluffs Mountain Bike Area. Besides being a fun ride or hike the scenery of the Ramblin and Rocky Tops trails rivals some of what is found in the neighboring National Parks. If you would like to see it for yourself then all you have to do is grab your bike or 'Take a hike'.